The Coalition parties were keen to stress how "busy" the government would be following this week's Queen's speech, after Labour accused them of presiding over a "zombie government". The Conservatives highlighted investment in transport as one area of particular activity, claiming that the Coalition was spending the most on infrastructure for generations. Neither rely on plans announced in the Queen's speech, but claims about road spending can be backed up, as long as government spending plans are kept to. Some have suggested that this is by no means certain, and that "Infrastructure projects are too often promised and too rarely delivered in this country." However little comparable data exists on the amount of money invested in the rail network over the past 150 years, meaning that the second claim is harder to justify. 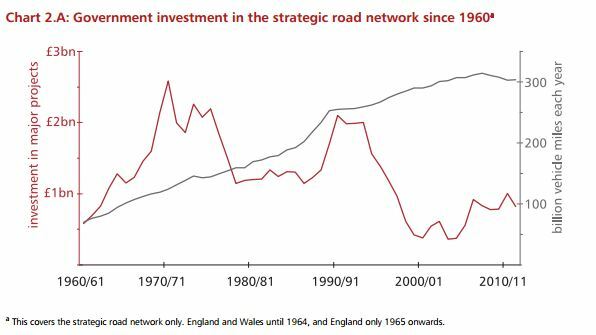 The claim that the government is investing more in Britain's roads than at any point since the '70s is drawn from the 2013 Spending Review, which pledged to spend £28bn on building, extending and repairing roads over a six year period between 2015/16 and 2020/21. Of this money, just over £15bn will be given to the Highways Agency to cover the strategic road network. It will see its funding allocation grow from £1.5bn to £3.8bn over these six years. However some have noted that the planned rise in the Department for Transport's allocated budget for capital projects over this period isn't nearly as sharp, leading some to question how the funding commitment would be met. "The government is effectively creating a liability with this commitment so the money will have to be found from somewhere. If they're not getting the money in, the future government will either have to de-legislate or raid other departments. This is very difficult if it's not clear where the money is coming from." "Infrastructure projects are too often promised and too rarely delivered in this country, and that cycle must be broken. If these announcements are to translate into short-term confidence, medium-term construction jobs and long-term competitiveness, the Whitehall machine must be judged by the number of diggers on the ground, not strategies and press notices." As with road-building, the claim that the Coalition is overseeing the largest investment in the railways since the Victorian era is not new, coming as it does from a 2012 announcement on the government's spending proposals for the 2014-19 period. Chief Secretary to the Treasury Danny Alexander has been asked directly about the evidence behind the claim in the House of Commons, where he admitted that prior to the 2012 announcement, "the only comparable national rail investment plan since the Victorian era was the 1955 British Rail modernisation plan." The investment proposals in the 1955 plan were valued by the Treasury at £15bn in current prices, which compares to a total of £26.5bn due to be spent between 2014 and 2021. Around £16bn of this was expected to be accounted for by HS2 - the high speed rail link between London and the north of England - which is a proposal that actually predates the current government, although it was responsible for giving the go-ahead for the project in January 2012. While the scale of the HS2 project alongside capital investment in National Rail networks and Crossrail might suggest a relatively high level of spending on rail infrastructure over the coming year, the lack of comparable data makes this claim impossible to verify in practice, and therefore should be treated with caution. Is the UK's food supply hanging in the balance? Is the price of fuel the greatest concern to the nation?